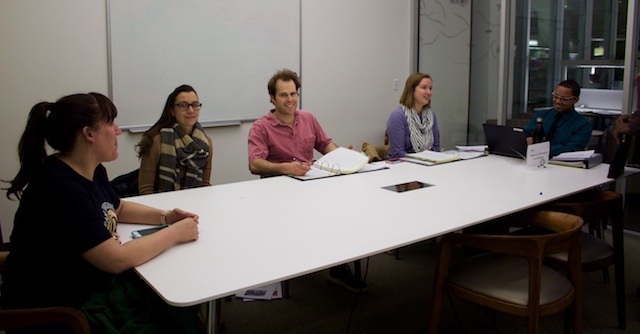 On Monday, the Madison Food Policy Council (MFPC) gathered at the Central Library to meet individually with the 2018 SEED Grant finalists. Each finalist was granted 15 minutes to present their projects on how to increase healthy food access or education for City of Madison residents. This year, the SEED Grant program received 23 applications requesting a total of over $180,000 in funding. The MPFC winnowed the list down to 13 finalists, but the grant can only allocate up to $50,000 in funding with a maximum of $10,000 for a single grant. George Reistad, food policy coordinator, says the funding is limited but there is no set amount in terms of how many organizations receive grant funding. “It’s definitely good to have a strong applicant pool, it makes a case for why this program is so important. The only time I think we approached a level like this was the first year the SEED Grant came out in 2014, when we had 26 applications for almost $187,000 — so we were very close to the inaugural year of the SEED grants which is pretty good for our 5th year,” Reistad said. The finalist meeting provides an opportunity for the MFPC to better understand the amount of funding each organization needs to accomplish their goals for the final budget. Reistad is also currently working with Mayoral Office Clerk Jasmine Brey to streamline the contracting process so that funds can be allocated to grantees through a face-to-face process rather than mail. The applicants had a multitude of project goals ranging from supplying fresh, culturally appropriate foods in meal programs and food pantries to supporting food system education to youth in low-income areas. The MFPC plans to deliberate over the final budget decision next week. Moving forward, the Food Policy Council will make their final decisions by April 4, then they will present the final budget to the Common Council on April 10 to approve the grant distribution. The Madison Community Foundation is issuing its largest grant ever at $1.1 million to support the community schools initiative in the Madison Metropolitan School District. The Foundation for Madison’s Public Schools will be matching the grant one-to-one through fundraising efforts and donations over the five-year grant period. The City of Madison’s Neighborhood Grant Program, which awards a total of $25,000 to neighborhood projects every year, is currently accepting applications through Feb. 19.